This series of microphones can be attached to full-face, full-face (jet-type) or traditional style (half-type) helmets for motor sports. The model for traditional style (half-type�jhelmets has a flexible pipe 30cm longer than those of other models of the same series. This set for a full-face helmet is comprised of a microphone and a speaker. T he standard set is the combination of KT002 (a microphone) and KT038 (a speake r and a cable). Other combinations, with two monaural speakers or two stereo speakers, are also available. * For KT004 or KT006, sets without a volume control are also available. 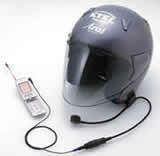 This set for an full-face (jet-type) helmet is comprised of a microphone and a speaker. The standard set is the combination of KT001 (a microphone) and KT0 38 (a speaker and a cable). Other combinations, with two monaural speakers or two stereo speakers, are also available. * For KT007 or KT009, sets without a volume control are also available. This set of a microphone and a speaker is designed to be attached to the surface of an full-face (jet-type) helmet. Installation is very easy. Just stick the attachment fastener on the surface of your helmet. If you have an extra fastener (available separately), you can use the same microphone with two helmets. his set of a microphone and a speaker is designed to be attached to the surface of an full-face (F-type) helmet. Installation is very easy. Just stick the attachment fastener on the surface of your helmet. If you have an extra fastener (available separately), you can use the same microphone with two helmets. This set, comprised of Bilsom earmuffs and our noiseless microphone, is a perfect choice when you do not have to wear a helmet amid considerable noise. 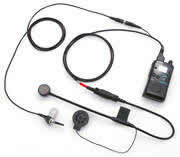 An optional set with a pair of regular headphones and a noiseless microphone is a lso available. With this connection cable, you can use a cellular phone or a PHS while wearin g your helmet. For those who have to make phone calls under a particularly no isy circumstance, an amplifier is also available. * Do not use a cellular phone while you are riding a motorcycle. * In order to use this product, you have to have a microphone system (such as our KTOO4) used with a helmet. * This product does not include a cellular phone. With our handy connection cable (KT032), you can use our noiseless microphone with your transceiver. An optional set with a microphone system (such as KT00 4) and [a changeover switch] is also available. When you place an order, plea se select the cable suitable for your transceiver by referring to the table be low. * We can accept orders for a customized cable in case your transceiver is not included in the list on the table. * This product does not include a transceiver. For communication of higher quality, we recommend that you use an external ant enna. You can easily install an antenna by screwing this base to the numberpl ate (license plate) of your motorcycle. With this amplifier system for tandem riders, the rider and the passenger, con nected with a cable, can talk with each other simultaneously. With a connecti on cable included in the system, this product is highly reasonable in price. There is an optional set with a customized amplifier (KT019) and [a changeover switch for an additional input]. With this set, you can listen to the radio or enjoy music from your Walkman. With a DF 707 (KT020) or DF 808 (KT021) amp lifier system, developed from KT019 customized amplifier, you can enjoy talkin g with your friend and listening to music simultaneously. The DF 808 amplifie r system can be used as an intercom for a conversation between two to four peo ple riding a motorcycle with a sidecar. * In order to use this product, you need a microphone system to be used with a helmet (such as our KT004) and a connection cable (such as KT044). You can talk with your friend on the same motorcycle and communicate with some one else simultaneously. Up to four people can talk with each other simultaneously.